Kits are supplied as pre-cut patterns together with full fitting instructions, a diagram of the components, a spray bottle and a squeegee. All kits are designed for easy self fit DIY installation by the customer. Take a look at the Installation Instructions and Video to see just how easy the kit is to fit. However, if you would prefer not to fit it yourself, Chipguard UK are approved installers of 3M VentureShield and offer a full fitting service at our dedicated workshop in Waterlooville (Please contact us for further details). 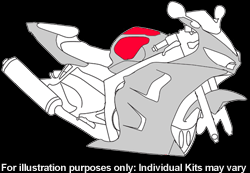 Click on the link to see the areas typically covered by a Full Kit. We provide a 5 year paint protection film warranty. 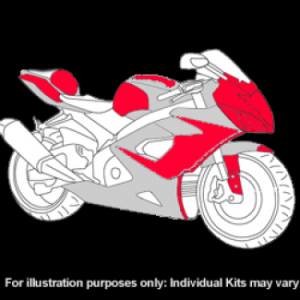 Our Paint Protection film self fit DIY kits are pre-cut to fit your motorbike like a glove and they couldn’t be easier to buy, using Chipguard UK’s mail order service. The kit will be delivered in a specially designed pack to protect it and for your security it has to be signed for on delivery. The film comes with a 5 year warranty. To see just how easy the kit is to fit, take a look at the Installation Instructions and Video. To find out how to look after the film once fitted visit Care and Maintenance on the FAQ page. It has a high gloss finish which enhances and protects the appearance of your motorbike and will not yellow with age. It protects your motorcycle paintwork against damage and it will maintain it’s A1 appearance and resale value. A further benefit of this fantastic product is that we provide a 5 year paint protection film warranty.